This tart can be served as a light meal or as a savoury tart at tea time. The pastry can also be used for various other recipes. 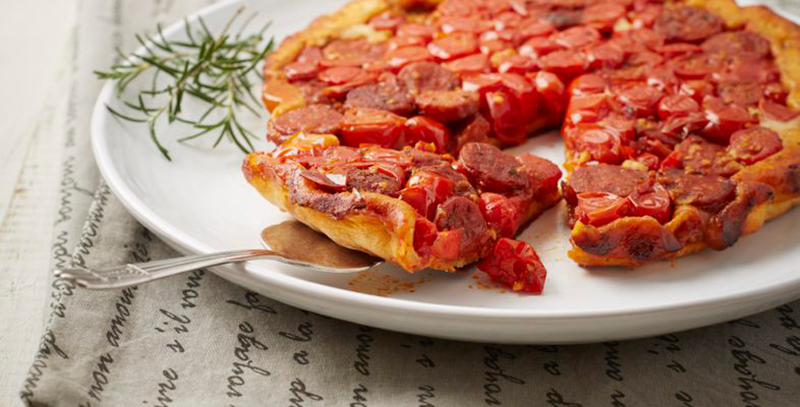 Chorizo has a very specific flavour, and works really well with tomatoes. PASTRY: Place flour, butter, pecorino and rosemary in a food processor and blend until it resembles coarse breadcrumbs. Add cottage cheese and egg and mix until it forms a soft ball of pastry. Gently press pastry into a circle the size of a side plate and cover with plastic wrap. Refrigerate for 30 min. FILLING: Heat a thin layer of oil in a frying pan over medium heat and fry sausage for a few minutes or until aromatic. Remember that the sausage is quite fatty, so oil may not be necessary. Add tomatoes and saute until the skins begin to burst. Stir in the rosemary and paprika and season to taste with pepper. The sausage is quite salty, so salt is really not necessary. Reduce the heat, cover with a lid and simmer for 5 minutes so that the tomatoes form a sauce. Spoon out and allow to cool. Preheat the oven to 200 °C. Spoon filling into a 22 cm, shallow tart dish and sprinkle with cheese. On a lightly floured surface, roll out pastry into a circle big enough to overlap the edges of the tart dish. Place pastry over the filling and fold in, in between the filling and the dish. Bake for 30 min or until the pastry is golden brown. Allow to stand for a few minutes until the sauce has been absorbed a bit. Place a plate over the tart dish and turn out in one quick turn. The pastry will now be on the bottom, with the tomato filling on top. Serve as a light meal with a green salad. * If chorizo is not available, use 125g bacon. Halve and pit 8-10 olives and add to the filling. * The pastry freezes very well. Make a double batch and freeze the rest for later. Defrost overnight in the fridge and use as needed. * Cut the pastry into strips, twist and place on a baking tray. Bake at 200 °C for 10 minutes or until golden brown. Serve as cheese straws with drinks or a coctail. You could even sprinkle a little extra rosemary over them before baking. * Make a sweet pastry: Leave out the cheese and herbs and add 30 ml soft brown sugar. Use with sweet fillings for dessert or tea time treats.